Technology and discussions of technologies were notably absent from the Civicus World Assembly. Even the head of Africa's first mobile phone company speaking in a BBC World Service debate missed speaking about how bringing a mobile phone infrastructure to Africa creates a potentially massive platform for driving, evaluating and improving development. that really made it worth going. 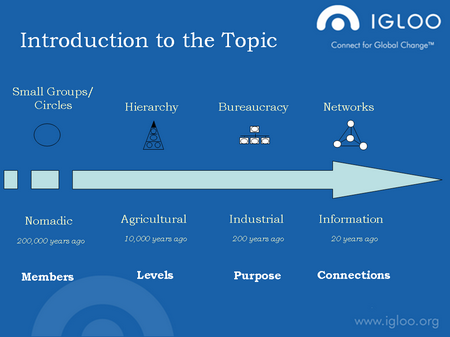 The slide itself may look fairly plain – but in showing how the rise of the network as an organising principle has arrived, enabled by technologies of connection – parallel to the rise of bureacracy, enabled by technologies of control – it provides a coherent framework for explaining and understanding the changes we're grappling with right now. We're in the age of the network. The network is new (in the scheme of things). And the network reconfigures our social and organisational relationships – not just our technologies. Given that the majority of delegates at the World Assembly spent their formative years before the rise of the network, it is not suprising that using networked strategies for promoting development and accountability had a low profile through the event. Both the leaders and the stakeholders/beneficiaries of Civicus's member NGOs lack an internalised understandings of networked working environments. By contrast, Youth Assembly Delegates (18 – 25 year olds who met before and then took part in the World Assembly) often had at least an unconciously internalised understanding of the network, and one that significantly shapes their world views – yet, as the slide above showed me – we lack a comprehension of the place of this understanding in the current rapid development of the history of thought and organisational structures. Crucially, both young and old are low on the practical skills to operate effectively in networked ways.